WASHINGTON — Alaska Sen. Lisa Murkowski and Sen. Susan Collins of Maine plan to introduce an amendment to strip the Senate health care bill of a provision to defund Planned Parenthood, Murkowski's office confirmed Wednesday. The proposed Senate bill, the Better Health Care Reconciliation Act, bars Planned Parenthood from receiving Medicaid reimbursements for one year. Murkowski and Collins' amendment suggests they do not expect Majority Leader Mitch McConnell, R-Ky., to drop the provision from a rewritten bill that could be released at the end of this week. Murkowski and Collins, both moderate Republicans, have long opposed efforts by their party to defund Planned Parenthood. Federal law prohibits federal funds from being used for abortions, but the women's health centers do accept federal funding and Medicaid payments for other health care offered to patients. Abortion opponents argue the organization should not be allowed to take any federal funding. The four Planned Parenthood clinics in Alaska serve an estimated 7,000 women each year. Murkowski's spokeswoman Karina Petersen said in an email that Murkowski "has been saying that she's concerned the bill bars Planned Parenthood from receiving Medicaid reimbursements for one year and plans on introducing an amendment to strip that provision out." 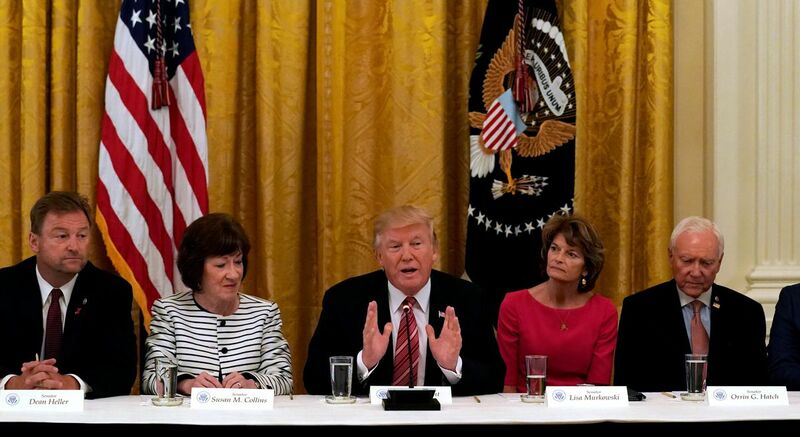 Whether Murkowski or Collins will ultimately support the Senate bill in the coming weeks remains unknown. Collins has said she would not support the bill as introduced and wants major changes to how the bill manages Medicaid spending. Murkowski said Tuesday she is still undecided on the bill and is continuing to gather information on exactly how its provisions would affect Alaskans. But Murkowski might get more of what she wants from working with moderate Democrats than by negotiating with the most conservative Republicans in the Senate. In a television interview Tuesday, which Murkowski posted to her Twitter account Wednesday morning, she advocated working with Democrats on changes to health insurance legislation rather than attempting to find a compromise within the slim Senate majority of 52 Republicans. "The Congress of the United States — whether you're a Republican or a Democrat, in the House or in the Senate — shouldn't we all be working together on the problems that are part and parcel of who we are as Americans?" she said. "This is not for Republicans to fix or Democrats to fix. This is for us as Americans to fix. So when did we get to the point where we said, 'No. We're not going to talk to Democrats about a fix'? We should be working with our colleagues on the other side of the aisle."